Wolf Commercial Real Estate, a premier Moorestown commercial real estate brokerage firm with expertise in Moorestown commercial real estate listings and services, is now offering Moorestown office space for sale at 136 West Route 38 Moorestown NJ. This Moorestown professional office space for sale is a highly visible professional office building. This Moorestown office building for sale has +/- 3,200 square feet of professional office space for sale in Moorestown. The asking sale price for this professional office space in Moorestown is $700,000 and this Moorestown office building at 136 West Route 38 Moorestown NJ sits on approximately .80 acres. This professional office space in Moorestown is available for immediate occupancy. This Moorestown professional office space for sale is available through Wolf Commercial Real Estate, a Moorestown commercial real estate broker that specializes in Moorestown commercial real estate listings and services. This professional office space for sale in Moorestown is adjacent to many residential communities. More than 50,000 vehicles per day pass by this Moorestown office space for sale and this Moorestown professional office space offers convenient access to the New Jersey Turnpike, I-295, and Route 73. In addition, this Moorestown office building for sale is nearby many other retail and professional amenities. 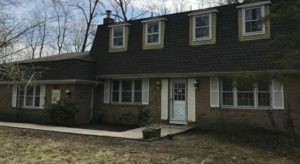 This Moorestown professional office space for sale is being brokered through Wolf Commercial Real Estate, a Moorestown commercial real estate brokerage firm with expertise in Moorestown commercial real estate listings and services. In addition, this professional office space in Moorestown is close to the Moorestown Mall and there are 12 parking spaces available at this Moorestown office building for sale at 136 West Route 38 Moorestown NJ. There are five private offices, a conference/board room, a library and a full kitchen at this professional office space for sale in Moorestown. Nearly 176,000 residents live within a five-mile radius of this professional office space for sale in Moorestown and the average household income in the same area of this Moorestown office building for sale is $104,430. This Moorestown office space is in one of the most affluent suburbs in South Jersey. For more information about this Moorestown office space for sale at 136 West Route 38 Moorestown NJ or about other Moorestown commercial properties for sale or sale, please contact John T. Mozzillo (856-857-6304; john.mozzillo@wolfcre.com) at Wolf Commercial Real Estate, a Moorestown commercial real estate broker.